Get ready for the ultimate snack-down when Gordon Ramsay and Christina Tosi invite celebrities into the MASTERCHEF kitchen to show off their culinary skills in head-to-head contests for charity. Competitors include Trai Byers and Grace Gealey Byers; Nene and Gregg Leakes; Cheryl Hines; Kal Penn; Ronde Barber and Tiki Barber; and Joel Madden and Benji Madden. MASTERCHEF CELEBRITY SHOWDOWN premieres Monday, Jan. 2 at 8/7c on FOX. They started with My Kitchen Rules US with so called celebrities, and now it's Masterchef US celebrity. Who do they think they are feebly trying to amuse. The mindless? 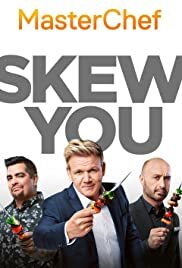 Gordon Ramsey and Cutis Stone and the other hosts should be cringing. They certainly don't need the money, so why belittle themselves hosting these types of cooking(!) shows. If you 'd like to see for yourselves, beware. Not worth the effort.